Welcome back to the blog! Today I have a super easy and quick recipe for you. All you need are the four basic ingredients and your choice of spices. I wasn’t kidding when I said this is easy. Cook the rice per the instructions on the bag or box. While the rice is cooking, cut up the strips of beef and cook on the stove. Add any spices you desire. Also, steam some broccoli in the microwave. At this point, you are rocking multitasking! Once the beef is fully cooked, pour some teriyaki sauce over the beef. I switch teriyaki sauce every time I buy it. Choose whichever brand you like! Once the teriyaki sauce has warmed and you’re rice/broccoli is cooked, you are ready to put the meal together. Just add some of each to a bowl and eat with your favorite chopsticks! Enjoy! 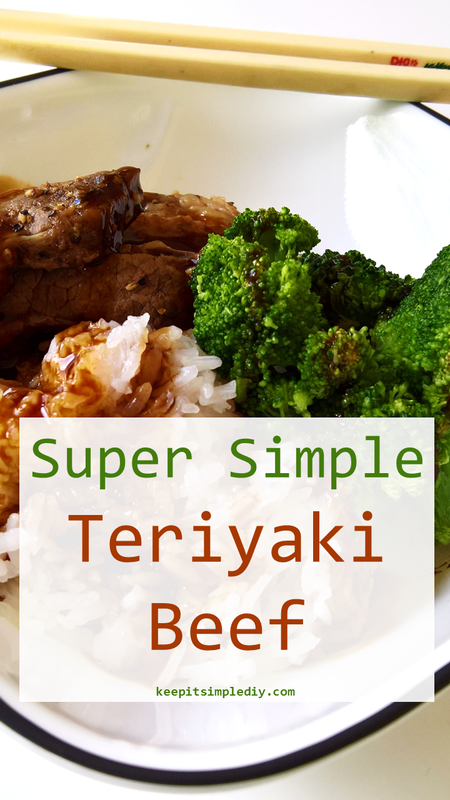 Beef teriyaki is a favorite around here, your recipe sounds wonderful. I’ve always wanted to know how to make teriyaki beef, I used to get it a lot when I was in college. I love this recipe, can’t wait to try it! I love the sound of this! Thanks for a great recipe. I love simple recipes. This sounds great! You had me at “Simple”! I love Teriyaki Beef and look forward to making this tasty dish at home. In fact, I’ll make an extra large batch for freezing in individual containers for either lunches or an instant mid week meal. Looks so yummy!! I will have to make this tonight. Oh my gosh this is so simple!